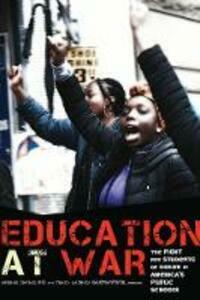 Education at War: The Fight for Students of Color in America's Public Schools, attempts to shape educational research and practice to more explicitly consider the relationship between education, capitalism and war, and more specifically, its' impact on students of color. The authors, as a whole, contend that the contemporary specter of war has become a central way that racism and materialism become manifested and practiced within education. In particular, this collection asserts that the contemporary neoliberal characterization of education and school-based reform is situated within the global political economy that has facilitated a growth in the prison and military industrial complex, and simultaneous divestment in education domestically within the U.S. Education at War attempts to make research relevant by bringing the tensions within young people's lives to the fore. The heavy shadow cast by recent U.S. led wars re-organizes the sites of learning and teaching nationally, as well as differentially, within specific sites and upon particular communities. Nonetheless, the examination of this context is not enough. Rather, we consider how such a contemporary context can facilitate educational spaces for communities and youth to grow their vision for a different, and hopefully a more humanizing future. Thus, the book contributors will collectively explore how resistance can produce the opportunity for rich, diverse and transformative learning for marginalized students and communities. The lives of People of Color are the forefront of Education at War: The Fight for Students of Color in America's Public Schools. Whereas there are many attempts to theorize about the global implications of war, less attention is paid to the ways that war shapes young lives in the U.S., particularly in an educational context. The book addresses the absence of youth-centered discussions regarding education during a political context of neoliberalism and war, and provides important perspectives on which to ground critical discussions among students and families, education scholars and practitioners, and policymakers.